“Triptychs (Mind’s Eye Series Book 3)” is a wonderful and fascinating anthology. This one is based on a series of photographs that were randomly given to the authors as inspiration for their stories. One of the most rewarding parts of this experiment is for the reader to view the picture and have their own ideas what the stories might be, only to see how different we all view the world. The stories range wide in scope and show great talent. 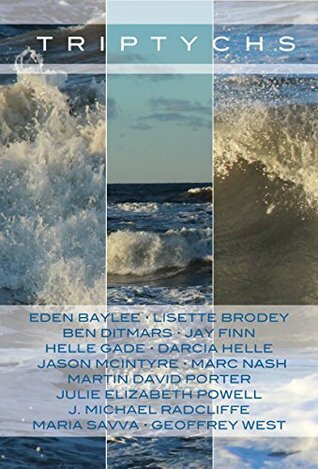 Some of the authors I knew and appreciated already from their individual work, such as Eden Baylee and Maria Savva, while others look likely to become new favourites, such as Jason McIntyre and J Michael Radcliff. I enjoyed all of the stories and will keep an eye out for the rest of the series. This is high quality reading. When I first read the title of this post I immediately thought of Karin Slaughter’s book, Triptych. Have you read it? I’ve done the exercise of writing a story based on a picture but it sounds like a great idea for a book. Thanks Christoph! My pleasure, Olga. Thanks for stopping by!